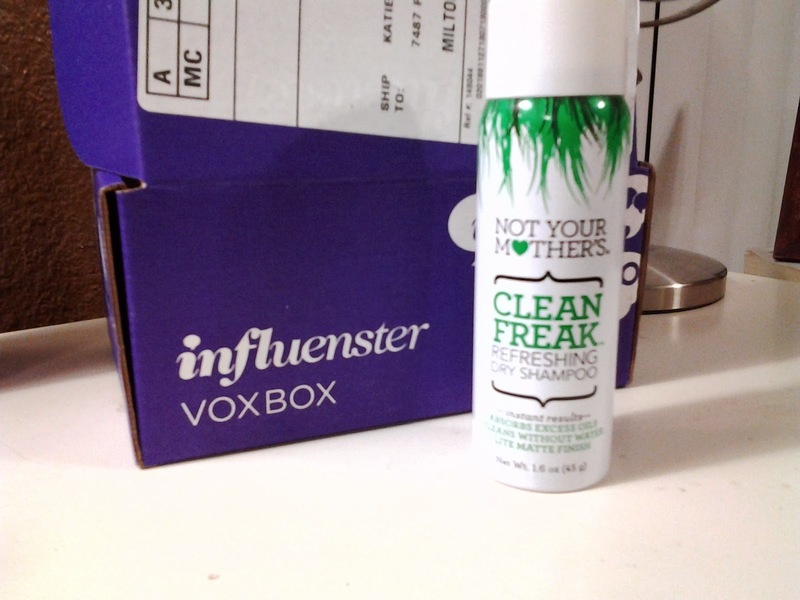 The first product I’m going to review (from the box of products I received from Influenster) is the dry shampoo from Not Your Mother’s. About Not Your Mother’s Clean Freak…. The nozzle on this can is really perfect — I love how it sprays out and really gives you a strong stream, but not too much product, in my opinion. It’s very misty and, when I used it, it didn’t leave any white residue in my hair. Which I was very thankful for! 🙂 The smell for this product is really hard to put a finger on…(I’m really bad at naming scents)…but it’s kind of close to an air freshener scent….but not the kind of air freshener I like. Haha! 😛 It is pretty strong when you first spray it, but it goes away very quickly and doesn’t linger in your hair at all. So not a big deal for me. I sprayed it at my (very oily) roots and after letting it sit for a minute, I used a brush to make sure it was dispersed throughout my hair. The oily-ness was instantly gone! It gave my hair a very matte, fresh look that I want when I have 2 or 3-day old hair. not only made my hair look clean, but feel clean to, made me fall in love with this dry shampoo! is the best I’ve ever used! Looks like a great product. I haven't heard of the is brand but I always like to read other people reviews and see what they think and in return I will go and try it out. So, I will have to consider this as well. Thanks for sharing. This is another product I would like to try. I have never given dry shampoo a thought. But would like to see how it would work on my thick hair. I have quite a few not your mothers hairs products. They always smell amazing! Thanks for this great product review. I've never used a dry shampoo before, but I read about them in magazines all the time. I absolutely love the name of this product and the earthy feel of the bottle image. I will have to give this one a try! Show Me Mama – I hope you enjoy it if you do give it a try. I've been enjoying mine a lot! Autumn – I haven't given dry shampoo much of a try, either. I've only tried a few in the past, and never really liked the results. But this one I actually like how my hair looks AND feels after using! Nicole – Dry shampoos are a good way to go to help keep your hair healthy by stretching the days between washing. Hope you enjoy it if you purchase it! Dry shampoo could be a great option for my sister. Thanks for the helpful review. I will keep a lookout for this brand and recommend it to her. Kate – You're very welcome — I'm glad it came in handy. Dry shampoo feels gross, but it works. How would his stuff compare to the Batiste sprays that are designed for specific hair colors? I use the brown one and it's effective but feels so heavy. Luz – Hmm, I actually haven't tried the batiste spray. But I would agree that it would be better, because you do have to work these into your hair a little or you will have a white cast to your hair.